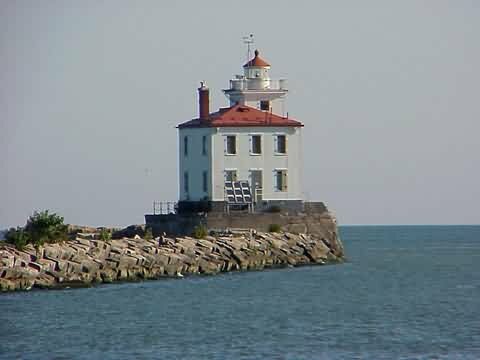 The Fairport Harbor West Breakwater Light was built in 1925 and sits in Fairport Harbor, Ohio at the mouth of the Grand River. It was constructed to replace the original Fairport Harbor Lighthouse, which now serves as a marine museum. The original Fairport Harbor lighthouse protected the shore and directed mariners for 100 years before being falling into disrepair. In June 1917, Congress appropriated $42,000 for the construction of a new breakwater light. That funding included monies that would be used to demolish the original lighthouse. However, the reality of destroying the older lighthouse didn’t sit well with the citizens of Fairport and as a result, the Secretary of Commerce agreed to let the old lighthouse remain. Despite having Congressional funding to begin, the outbreak of World War I delayed construction for several years. Constructed in Buffalo, New York, the iron frame was made of steel studding, floor beams, rafters, side and roof plating, cast-iron cornices, sills and lintels, which were riveted and bolted permanently together. This prefabricated section was secured by steel cables and transported aboard the steamer Wotan, 147 miles to Fairport Harbor. Once in Ohio, the interior mason and finish work was completed and the lantern room and lens were installed. On June 9, 1925, the Fairport Harbor West Breakwater Lighthouse was illuminated for the first time. The light is automated and closed to the public. However, it is possible to walk out along the breakwater to view the structure and grounds. In 2006, an effort began by a group of community activists to take ownership of the lighthouse with the goal of preserving the facility for future generations. The United States Coast Guard will continue to maintain the light and foghorn as a navigational aid. In September 2009, the United States General Services Administration put the lighthouse up for public auction via an online auction. After two more auctions, a bidder secured the lighthouse in August 2011 and as of August 2012 is converting it into a summer residence. From I90, take exit 200 and head north on OH-44. Take OH-44 for 3.9 miles and merge onto OH-2 West (which is still OH-44). In 0.9 miles take the exit for OH-44 north. In 2.4 miles you'll be at the entrance to the park. Park at the farthest end of the parking lot. At the far corner of the parking lot you'll see a walking trail that leads away from the parking lot. Take that path and follow it through the bushes and trees to the start of the breakwater (the path will become very sandy).